Ground transportation to downtown Mestre from Venice Marco Polo and Treviso Airports. From Venice Marco Polo Airport, the easiest way to reach downtown Mestre is on the ATVO Fly Bus, which runs between the airport and the Mestre railroad station. 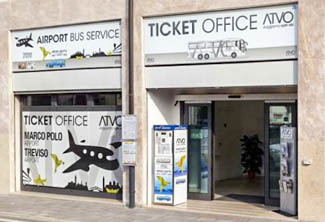 ABOVE: ATVO's office next to Mestre Railroad Station sells tickets for ATVO airport buses and other transit services. The buses from early in the morning until late evening, with several departures every hour during most of the day. Travel time is only 17 minutes, and the cost is modest: 8 euros for an adult, with a small discount for return travel (no time limit). For a current schedule, see the "Venice Marco Polo Airport - Mestre (Fly Bus - express service)" timetable on the ATVO Web site's Bus Service Venice Marco Polo Airport page. At the ATVO's ticket counter in the baggage-claim area. At either of the two ATVO ticket counters in the arrivals area (one facing the exit from baggage claim, the other to the left of the exit). From the ATVO's staff at the bus stops, who will also provide information if you need it. You can also order tickets online for specific dates from the ATVO's Web site, with a discount for your advance purchase. if you order two tickets or more. When ordering online, you'll receive an e-mail with a PDF booking confirmation. Print out the PDF file or the e-mail and use it as your ticket when boarding. Exit the arrivals hall at door D and look for the ATVO bus stops on your left. Stop 1 is for Mestre Railway Station. The ATVO Fly Bus arrives at at a new piazzale, or square, next to Mestre Railway Station. If you're staying at our recommended hotels by the train station, head for the station's main entrance and cross the street at the light. If you're staying elsewhere, request a free city map at the tourist office inside the railroad station. (Look for the tourist office on your right when you reach Track 1). Buses for the airport leave from the same place where they arrive in Mestre: about 50 meters to the left of the station entrance. If you don't have a ticket, you can buy one from a machine or at the ATVO ticket office near the bus stop. Again, be sure to validate your ticket before or immediately after boarding the coach. The No. 15 bus runs only twice an hour, and because it's a local commuter bus, it isn't geared to travelers with luggage. If you're arriving on Ryanair or Wizz Air, which use Treviso airport, take a Barzi Bus or ATVO coach to Venice's Piazzale Roma and get off in Mestre. For details, see our Treviso Airport Buses to Venice page. Photos 1 and 2: ATVO.